Ketchapp’s new title called High Hoops is our latest discovery in the genre of hyper-casual mobile games. 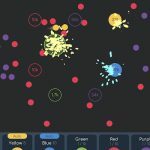 The game lets you control a bouncing ball. The main objective of High Hoops is not to let the ball fall off the boxy terrain while trying to bounce through as many hoops as possible. Do not be fooled though. This boxy terrain serves an important purpose. The first thing you see in High Hoops is a ball ready to bounce away and a bar underneath showing a hand gliding left and right. As soon as you tap on the screen, the ball starts bouncing forward. You control the movement of the ball with your finger on the screen at all times. You cannot tap and hold to change the direction left or right. 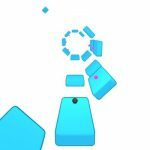 You have to hold your finger on the screen at all times and the ball follows your finger sharply. High Hoops is also a leveled game and you complete each level by bouncing a fixed number of times. The number of bounces required to complete each level increments as you progress in the game. Each time you bounce through a hoop, you get to skip a number of those bounces required to pass the level. You also collect gems along the way, which are used when unlocking new skins for the ball. There are also super blocks that let you bounce exponentially higher when you jump on them. It all sounds simple so far but do not be fooled because this game can sneak up on you. It gets more difficult as you progress in the game. It is easy to misjudge where you are going to land after each bounce and you will find yourself reaching for getting angry quickly. 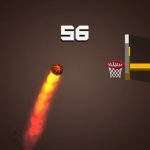 Therefore, we have compiled a list of High Hoops tips, cheats and tricks for you on how to get the better in this game. The metaphorical ball. In this case, keep your eye on where you are going to land after each bounce. Each level has a few hoops that depend on you bouncing significantly higher using the super blocks. You will be doing yourself a favor by always focusing on where you are going to land instead of focusing on the hoop because missing the hoop is not a problem. However, if you fall off the terrain, you have to play the level from the beginning. The boxed terrain serves an important purpose. Each time the ball bounces, it skips two boxes. This information becomes critical when there are three boxes but the ball can only possibly land on one of them because it is going to skip over the other two. As mentioned before, each time you bounce through a hoop you are rewarded with an extra bounces. If you can build a streak of perfect hoops, the rewards increase with each one. You can also build a streak of super jumps by bouncing onto the super blocks continuously. Each time the height of your jump is incremented and you get to jump over a difficult terrain. Don’t ignore those little treats in your way. There are many different cute and funny skins for your ball hidden in the game. The way to unlock them is using gems. So don’t just ignore them in your pursuit of clearing level upon levels. They add a lot of character to the game, as they make the game even more fun to play. 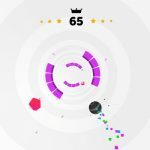 That’s all you need to know to succeed in Ketchapp’s latest mobile game, High Hoops. We hope we’ve provided you with enough information, as well as tips and tricks to save you from the frustration that this game aims to bestow upon you. So keep bouncing and keep smiling!